PARIS (Bloomberg) -- Renault said full-year earnings rose 59 percent as low-cost cars from the company's Dacia division pushed delivery growth and the automaker reduced costs. Earnings before interest, taxes and one-time items advanced to 1.24 billion euros ($1.69 billion) from 782 million euros in 2012, the automaker said today in a statement. Renault forecast today that 2014 revenue and operating profit will increase, and that the automotive division will achieve a positive free cash flow for the year. Renault had 2.5 billion euros in cumulative free cash flow in the last three years, exceeding a target of 2 billion euros, the automaker said today. The company set a goal of generating annual positive free cash flow in the next three years. New targets for the next three years also include boosting revenue to 50 billion euros and reaching a return on sales of more than 5 percent. The goal is underpinned by cost cutting, including a work force reduction and wage freeze that unions agreed to a year ago. "The commitment of all Renault employees enabled the group to meet its 2013 objectives in an unfavorable environment," CEO Carlos Ghosn said in the statement. "Strengthened by this result, the group can begin the second part of its strategic plan with confidence." Renault was the only carmaker of the top five sellers in Europe to report groupwide sales growth in the region last year, according to figures from the ACEA trade group. The increase was the result of the Dacia nameplate's 23 percent surge, which more than made up for a 1.5 percent decline at the namesake Renault brand. Renault said last month that industrywide demand in France and across Europe will increase 1 percent in 2014, with deliveries worldwide rising 2 percent. The French manufacturer, which owns 43 percent of Nissan, is pushing into emerging markets to make up for Europe's six-year plunge in demand for new cars to a two-decade low. Renault outlined plans earlier this month to double its market share in India. The carmaker received approval in December from regulators in China, the world's largest auto market, to build its first plant in the country. The Chinese factory, which will produce SUVs starting in 2016, is being set up in a joint venture with Wuhan-based Dongfeng Motor Group Co. The partner also builds vehicles with PSA/Peugeot-Citroen and is considering buying a stake in PSA. The Dongfeng-PSA collaboration won't affect Renault's plans to work with the Chinese carmaker, Ghosn said today on a conference call with analysts. The company's global sales, including the Dacia and Samsung brands, rose 3 percent last year to 2.63 million cars and light commercial vehicles. 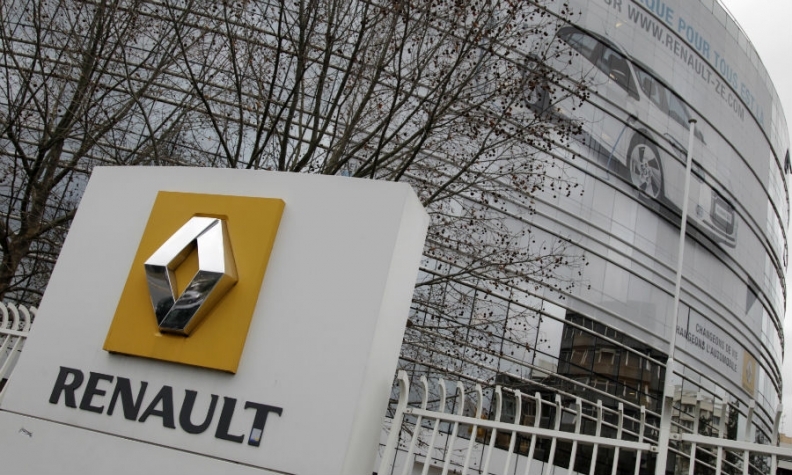 Growth was held back as Renault stopped selling component kits for assembly in Iran in line with trade prohibitions, costing the company 64,500 deliveries versus 2012, the manufacturer said on Jan. 21. Like French competitor PSA, Renault has said it's willing to re-enter Iran once trade sanctions against the country are eliminated. The Iranian auto market is poised to grow by at least least 50 percent, Ghosn said in an interview on Jan. 23. Renault and Nissan raised their goal for combined savings from cooperation by 7.5 percent in January to "at least" 4.3 billion euros by 2016 by intensifying joint projects in development, manufacturing, purchasing and human resources. Renault is introducing a modular-production strategy with Nissan to build more vehicles together and lower spending, Renault said in June. Sharing underlying technology will help the carmakers cut engineering and development costs as much as 40 percent and reduce spending on parts more than 20 percent by 2020, Jean-Michel Billig, executive vice president of engineering and quality, said at the time. Nissan contributed 1.5 billion euros to earnings last year, Renault said today. Currency effects cut operating profit by 619 million euros, Chief Financial Officer Dominique Thormann said.